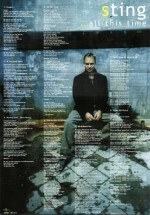 The UK issue comes with a black S and dots on front, and with 17 tracks. 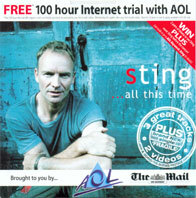 There is also a MAC session on the disc, containing the same videos in Quicktime format. 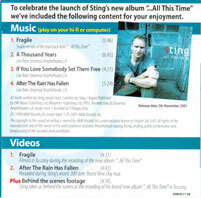 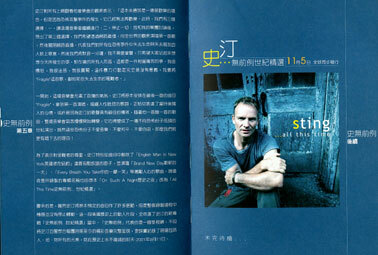 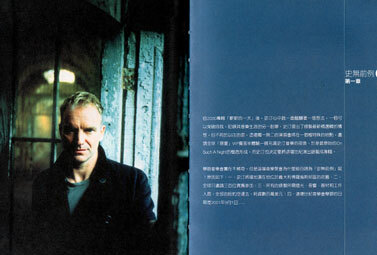 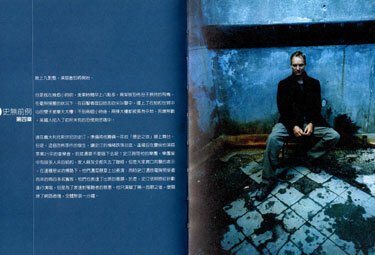 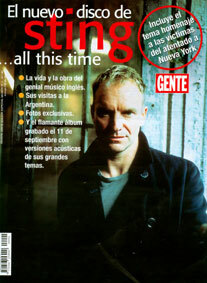 The magazine from the Mail on Sunday features a cover picture of Sting, and an in depth article and interview about Sting, and his feelings following the incidents on September 11 (the day the album was recorded). 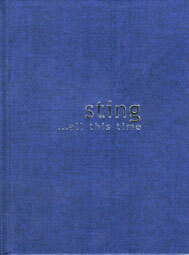 The cover is plain white, nothing on it. 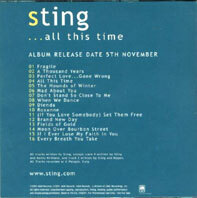 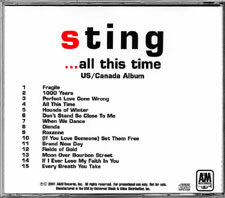 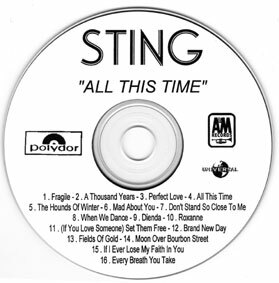 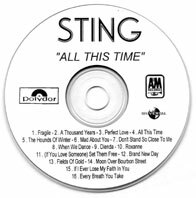 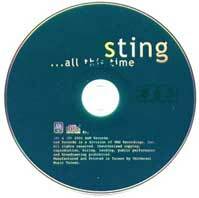 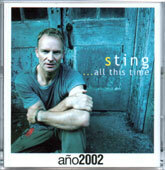 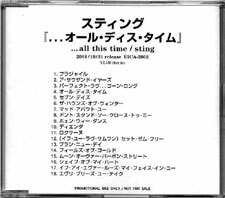 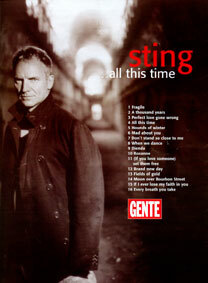 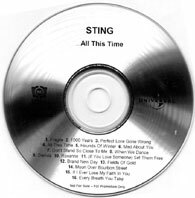 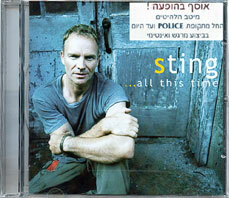 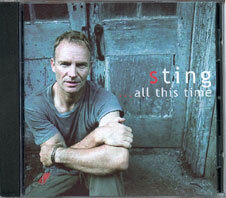 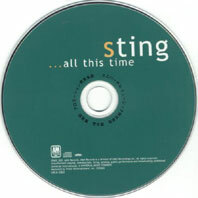 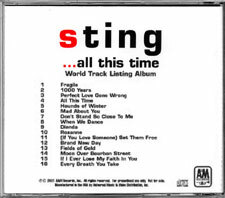 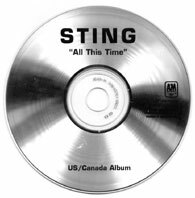 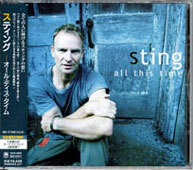 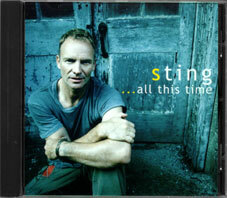 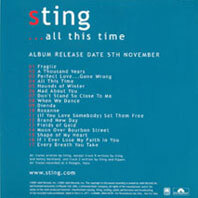 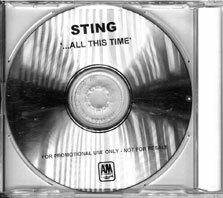 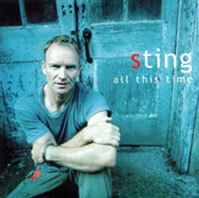 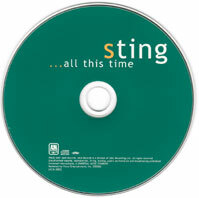 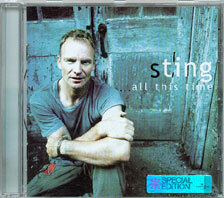 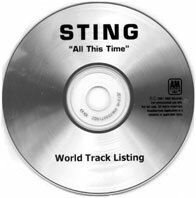 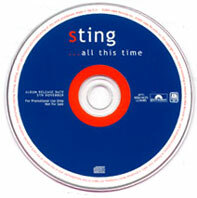 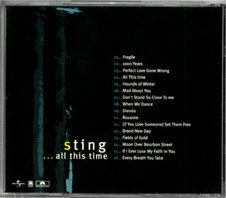 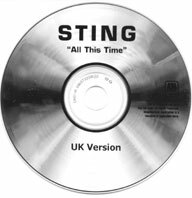 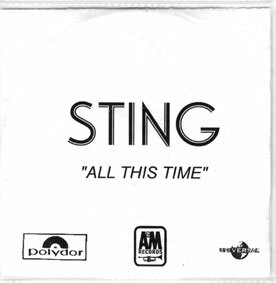 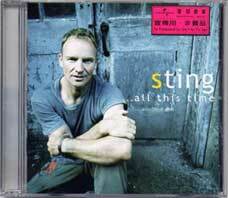 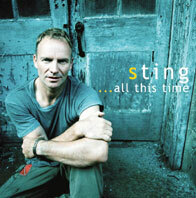 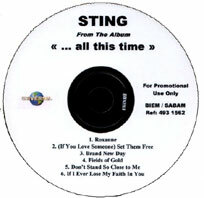 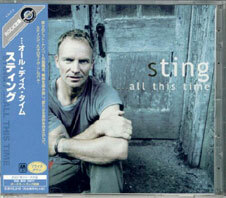 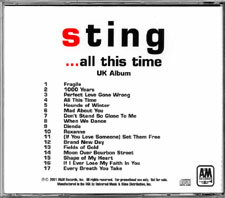 the cd itself was made by someone obviously not a sting fan: it says 1000 years instead of a thousand years, if you love someone instead of if you love somebody. 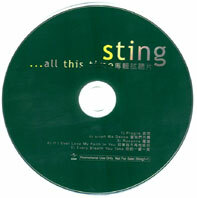 It seems there´s no catalogue # on the disc - and no a&m logo! 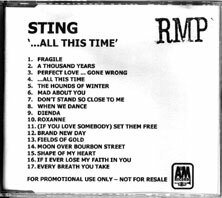 There´s a motor.de (the german distributor) and a universal logo on it - plus the tracklist. 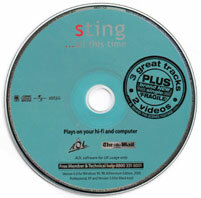 Around the hole in the middle it says: manufactured by record partner gmbh - telephone, fax and email. 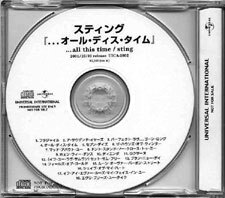 This version has the same errors as the german one (1000 years, IYL SOMEONE), and it also says "Med About You". 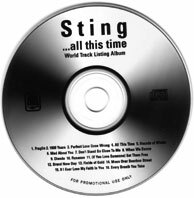 It has an A&M logo instead of the Universal logo and "World Track Listing Album" is printed beneath "...all this time". 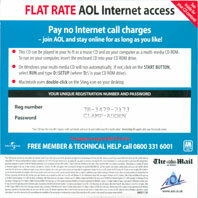 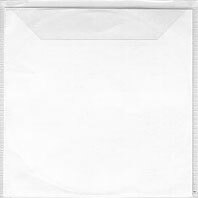 This promo CDr comes in plastic sleeve with printed conver. 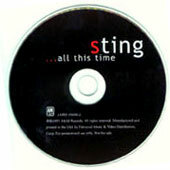 the disc is the same as the fnac promo pre-listening CD. 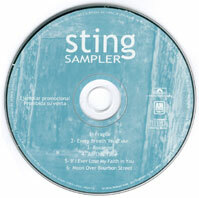 This 5 tracks sampler contains : Fragile / If you love / If I ever lose / Every breath / Roxanne. 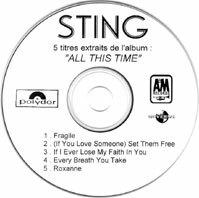 This strange promo CDr comes with Universal logo on disc and sleeve, and looks like French promo Cdr of Brand new day, so i suppose it comes from France. 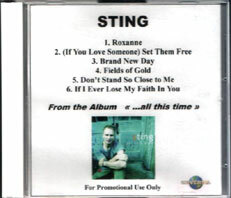 It is a sampler with 6 songs : Roxanne / (If you love someone) Set them free / Brand new day / Fields of gold / Don't stand so close to me / If I ever lose my faith in you. 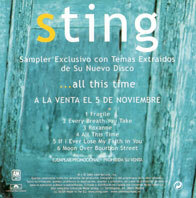 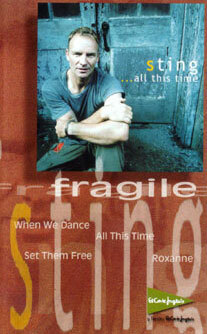 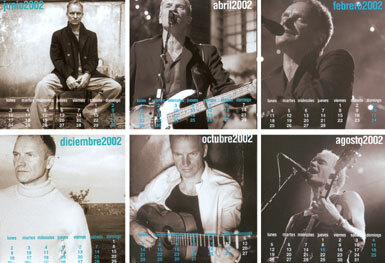 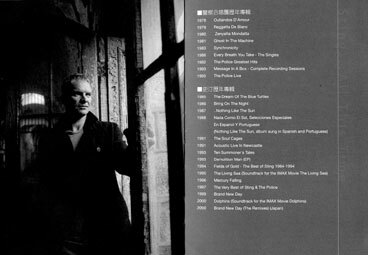 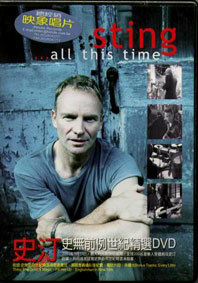 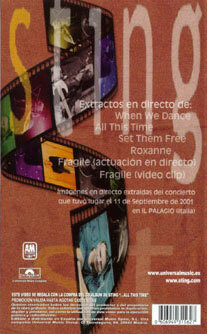 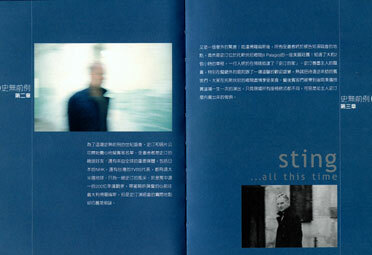 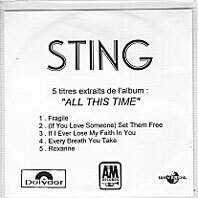 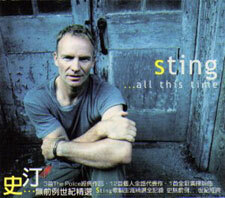 Distributed Spain, this issue is the French yellow sleeve CD, which comes with a special calendar of 7 cards, with Sting picture and a month on each side, picture of the album cover on the last card. 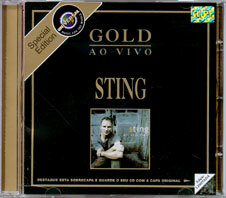 A very nice item. 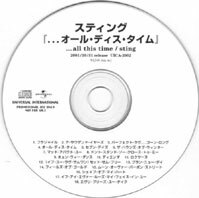 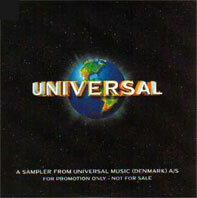 Rare 16 tracks promotional CDr which comes in generic Universal sleeve. 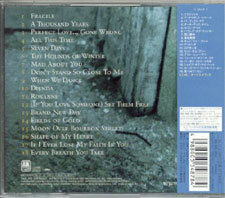 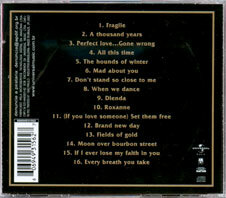 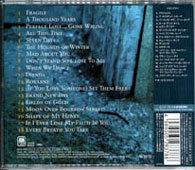 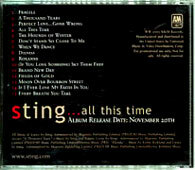 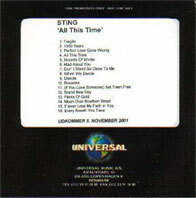 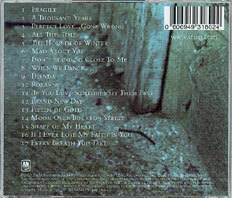 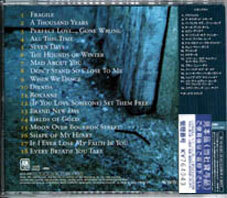 This very rare 18 tracks promotional CDr come in Universal track list sleeve. 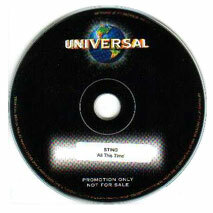 There is 2 different promo discs. 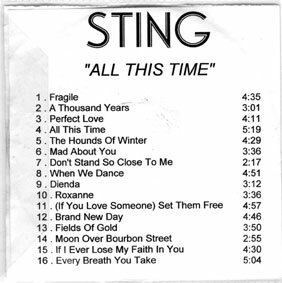 There is 3 promotional CDr from USA, each with special tracks listing... 1st is "US/Canada album" with 15 tracks (the most common), 2nd is "World track list" with 16 tracks, and 3th is "UK album" with 17 tracks... All are very rare and come with red front sleeve. 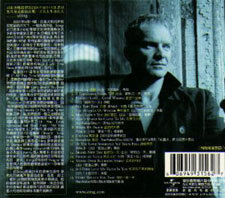 CD as the usual yellow sleeve design, but comes with a cardbord sleeve around. 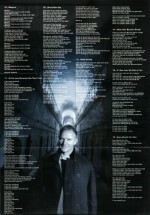 It also comes with a unfolded poster with lyrics of the tracks.